Autism is a lifelong developmental disorder that affects a person's ability to communicate and relate to others, thereby impairing learning and social skills. There has been a sharp increase in the number of children classified as having an Autism Spectrum Disorder since it was officially recognized as a special education category in 1991. Until fairly recently, most texts reiterated the long-accepted rate of up to 4 to 5 in 10,000; in February of 2007 the Centers for Disease Control (CDC) updated the official incidence rate to 1 in 150 from the previously reported 1 in 166 (see CDC on Autism and special education statistics in Fighting Autism). However, it was debated how far this increase is due to an actual rise in prevalence, or whether it reflects the change in how we identify learning problems. Many suggested that broadened definitions of the spectrum, plus the addition of this diagnostic category to the American education system, and the potentially resulting incentives of both, created a false appearance of increased prevalence (see anthropologist--and parent of an autistic teenager--Roy Grinker‘s Unstrange Minds: Remapping the World of Autism). Others insisted that it was necessary to add these diagnostic categories because more and more children were presenting with this peculiar set of symptoms, behaviors, and learning needs. Some felt that it was a combination of both. With the recent adjustment of the figure to 1 in 150 based on strict criteria, media reports increasingly seem to accept the phenomenon as real. Autism Spectrum Disorders are diagnosed on the basis of three primary deficits: impairment in communication skills; impaired social interactions; and restricted or repetitive and stereotyped patterns of behavior, often aggravated by over- or under-reactivity to sounds, touch, and other environmental stimuli. People with these disorders carry a wide array of severe to mild symptoms, therefore treatments must be tailored to individual need. There does exist a gray area at the highest functioning end of the spectrum, on a human continuum between clinical impairment and "normal" functioning, where diagnosis can become more sticky and subjective, even for seasoned professionals. Is the impairment real, or perceived? And are health professionals, including those working in integrative/complementary/alternative methods, encouraging too much pathology in an effort (well-meaning or otherwise) to promote these treatments? New findings may help resolve questions of diagnosis. Research is uncovering possible biological markers for autism such as differing immune system responses (UC-Davis M.I.N.D. Institute), brain abnormalities and the rate of head circumference growth in infants (UCSD Autism Center of Excellence), and genetic anomalies (USC/Vanderbilt and Yale). For simplicity, this Guide will refer to Autism Spectrum Disorders as ASD. These include the Pervasive Developmental Disorders as described in the Diagnostic and Statistical Manual of Mental Disorders, Fourth Edition - Text Revision (DSMIV-TR): autistic disorder; pervasive developmental disorder not otherwise specified (PDD-NOS); Rett's syndrome; childhood disintegrative disorder (CDD) or Heller's syndrome; and Asperger's syndrome, sometimes referred to as high-funtioning autism (HFA) or "non-verbal learning disorder", as it does not involve significant language delays or cognitive impairment. (The young narrator of Mark Haddon's 2004 best-seller, The Curious Incident of the Dog in the Night-Time, provides an accurate, albeit fictional, example of a person with Asperger's.) Other related terms are multi-system developmental disorder (MSDD, per Zero to Three diagnostic manual classification) and semantic-pragmatic language disorder (a term more commonly used in the UK ). Some of the resources listed below might also apply to Fragile X syndrome and hyperlexia. There is also some overlap with attentional disorders, but these problems have a separate literature and their own professional, research, and self-help organizations. CAM signifies the collective complementary/alternative medicine modalities and therapies. See also the NOTE to section on Professional Organizations below. Many alternative treatments that have attracted attention since the 1990's (when families started turning to the Internet for support and to learn of the latest treatment options), had highly positive anecdotal results. Even when success occurred in only a small portion of patients, people were willing to try the therapies due to this sense of urgency combined with the lack of effective conventional medicines for autism. Though a cure or major breakthrough may be the hoped-for result, many find these CAM interventions worthwhile so long as they lessen ASD symptoms. Research is beginning to identify immune dysfunctions and other subtle biological abnormalities, and their genetic underpinnings, that affect the brain in individuals with ASD. Holistic treatment approaches attempt to address these issues to enhance overall functioning. Some believe they render other conventional therapies and educational programs more effective; others allege that they interfere with them and confuse research results. Treatments for ASDs come from a very wide range of disciplines. Sometimes even 'off-label' use of conventional drugs is applied to autism, that is, the drug is approved but not for use in this disorder or for patients of/under a certain age. These treatments, while novel, are not necessarily CAM , but information on a few is included in this guide because they are so widely spoken and written of in autism circles. Some treatments for ASD that were considered 'alternative', or 'fringe' a decade or more ago have become standard protocol for ASD. For example, a gluten- and casein-free (gf/cf) diet is widely utilized (or at least tried) in this population, especially now that it is easier to find gf/cf foods, and since the publication of a popular book describing how the diet played a key role in the remarkable progress of one child with ASD (Seroussi, listed below). Most occupational therapists who work with individuals with autism are well-versed in sensory integration therapy (SI), recognizing varied ways in which persons with ASD seek sensory input to try to 'fix' the sensory processing disorders that render them under- or over-reactive to sounds, lights, gravity, touch, smells and/or tastes, etc. Now speech therapists, teachers, and other practitioners take training in SI as well. These approaches have earned a mainstream place in therapy programs for individuals with ASD, often even being included in school IEPs (the Individualized Education Program required by law for children with special education needs). Similarly, a few years ago if one ran a search in PubMed (See Gov't. Resources below) on "autism AND alternative medicine", most of the resulting citations came from the field of music therapy. Now more and more music therapists are employed at schools and treatment facilities. The role of certain childhood immunizations in the increase of ASD incidence has been a hot-button issue in recent years. While the Institute of Medicine (IOM) concluded in 2004 that there was no link, some autism advocacy and vaccine information /reformation groups have criticized the IOM report and questioned the Institute's credibility and objectivity (as detailed in David Kirby's 2005 book, Evidence of Harm). Families affected by autism who believe vaccines played a role may join the debate or leave it to the scientists. However, most continue to seek unconventional treatments, including those that address possible adverse effects of vaccines, such as mercury toxicity resulting from exposure to the preservative thimerosal (containing 49.5% ethyl mercury) found in most childhood vaccinations up to 2001. (In the U.S., all childhood vaccines are now administered in thimerosal-free forms - with the exception of some flu shots - as the last vaccine supplies containing this preservative expired in 2003.) Several studies have since been conducted in an effort to determine whether thimerosal is accumulated in the body and whether it poses a potential threat to infant development. The National Institute of Allergy and Infectious Diseases summarized these studies in a fact sheet on the NIAID web site. The Alternative Medicine Foundation aims always to remain impartial while believing in the public's right to CAM information, therefore we include resources related to this issue. NOTE: Some of the most effective treatments for ASD are educational and behavioral programs and are not covered here. Information and further links are available on the Autism Education Network. The number of information web sites for autism and related disorders has grown rapidly in the past several years. This Guide does not attempt to be comprehensive but to offer selected key resources and web sites with CAM-related content that will lead you to others. Note: some standard and important texts have been included which do not particularly fall under the realm of CAM, but which support the choice to try CAM treatments. Demonstrates how autism can be treated as a medical disease, rather than a behavioral disorder, by reducing neurological inflammation and thereby reducing autistic behaviors. How to measure the body's toxic load and promote cleansing of both environmental and self-generated poisons. 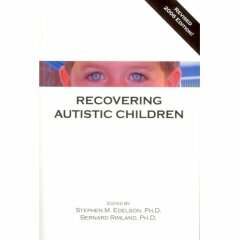 Authoritative text by research psychologist/parent of an autistic child demonstrating the biological basis for the disorder. Rimland, founder and director of the Autism Research Institute (see Organizations below) was a longtime advocate of vitamins, nutritional supplements, and other complementary treatments. Breaks down complex biomedical concepts in a guidebook for the reader. Through case studies, Dr. Bock seeks to find and treat the root cause of illness rather than its symptoms, applying nutritional and medical therapy to reduce toxin load and help the body heal itself. Many different diets have been suggested and parents/carers can waste time and money trying the wrong diet. The author reviews current scientific evidence for a variety of diets combined with practical advice on the application of such interventions. Describes a condition in which the central nervous system misinterprets messages from the senses. First published in 1998, the new edition features information from recent research on motor skill problems, ADHA, autism, and other related disorders. 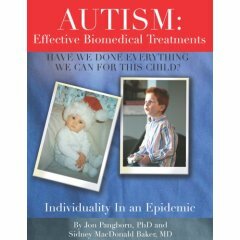 Extensively updated revision of "Treating Autism" (2003), following in-depth stories written by 31 parents and doctors who have used the Defeat Autism Now (DAN!) biomedical treatments recommended by the Autism Research Institute. Gives a step-by-step treatment guide for parents and doctors based on the belief that ASD is a complex biomedical illness resulting in significant brain malnutrition. Describes important diagnostic tools needed to select appropriate treatment programs, explains newly available major therapies, and identifies safe and effective options. Jon Pangborn Ph.D., Sidney M Baker M.D., Bernard Rimland Ph.D.
Integrates information from the fields of biochemistry, immunology, genetics, nutrition, and microbiology into a guide to antifungal and antibacterial therapies, gluten and casein restriction, homeopathy, vitamin therapy, gamma globulin treatment, transfer factor therapies, treatment of food allergies, and alternatives to antibiotic therapy. A family's quest to treat a son with autism, detailing how a gluten and casein-free diet greatly enhanced his progress. Understanding and implementing special diets to aid in the treatment of autism and related developmental disorders. Classic work by a pediatric allergist and environmental medicine specialist detailing how one can detect and treat food, chemical and allergen sensitivities. Although the P/N method described involving pinprick tests can now be bypassed with a blood sample sent to a lab, this text is still relevant for parents of the sickly, hyperactive, irritable, learning and/or behaviorally impaired child. The classic text introduces the concept of sensory integration dysfunction and how it can affect children--from mild learning problems to autism. Forerunner of many books on SI. Recent important reviews/reports of research on oxidative stress and mercury toxicity in ASD. Geier DA, Kern JK, et al. "Biomarkers of environmental toxicity and susceptibility in autism." Journal of the Neurological Sciences, 2009 May 15;280(1-2):101-8. .
Palmer, RF, Blanchard S, Wood, R. "Proximity to point sources of environmental mercury release as a predictor of autism prevalence." Health and Place, 2009 Mar;15(1):18-24. Blaylock, RL. "A possible central mechanism in autism spectrum disorders, part 1." Alternative Therapies in Health & Medicine, 2008 Nov-Dec;14(6):46-53. "A possible central mechanism in autism spectrum disorders, part 2: immunoexcitotoxicity." Altern Ther Health Med, 2009 Jan-Feb;15(1):60-7. "A possible central mechanism in autism spectrum disorders, part 3: the role of excitotoxin food additives and the synergistic effects of other environmental toxins." Altern Ther Health Med, 2009 Mar-Apr;15(2):56-60. Boso, M; Emanuele, E, et al. "Effect of long-term interactive music therapy on behavior profile and musical skills in young adults with severe autism." Journal of Alternative and Complementary Medicine 2007 Sept;13(7):709-12. Hanson E, Kalish LA, et al. : "Use of Complementary and alternative medicine among children diagnosed with Autism Spectrum Disorder." Journal of Autism & Developmental Disorders 2007 Apr;37(4):628-36. Palmer, RF; Blanchard, S et al. "Environmental mercury release, special education rates, and autism disorder: an ecological study of Texas." Health and Place 2006 Jun;12(2):203-9. Can be ordered through Science Direct. James, SJ. Jill, et al. "Metabolic biomarkers of increased oxidative stress and impaired methylation capacity in children with autism." American Journal of Clinical Nutrition 2004 80:1611-1617. Abstract and full text article are available on the journal's web site. McGinnis, WR. "Oxidative Stress in Autism." Alternative Therapies, 2004 Nov/Dec;10(6): 22-36. Kidd, PM. "Autism, an extreme challenge to integrative medicine. Part I: The Knowledge Base." Alternative Medicine Review, 2002 Aug 7(4): 292-316.
and "Part 2: Medical Management." Alternative Medicine Review, 2002, Dec; 7(6):472-99. Unis, AS et al. "A randomized, double-blind, placebo-controlled trial of porcine versus synthetic secretin for reducing symptoms of autism." Journal of the American Academy of Child & Adolescent Psychiatry. 2002 Nov 41(11):1315-21. Megson, M N. "Is autism a G-alpha protein defect reversible with natural vitamin A?" Medical Hypotheses. 2000 Jun;54(6):979-83. Featuring original articles and material from sources around the world, covers the latest people, products, research, news & viewpoints emerging in the autism field. Articles by, for, and about individuals with ASD with a focus on family issues, with a Best Practices section, tips and strategies, book reviews, recommended resources, contributions by ASD professionals; includes some CAM-related topics. Lenny Schafer began searching for and combing through autism articles in sources worldwide from newspapers to medical journals for a national e-newsletter in the early 1990's. The highly-regarded report is now available on Schafer's own site. NOTE: ASD treatments span many disciplines. See our list of available information Resource Guides under Modalities, and go to the sections on professional member organizations within each to find practitioners in craniosacral therapies (manual therapies guide), homeopathy, naturopathy, osteopathy, herbal medicine, etc. CAM therapies used in the treatment of ASD include dietary inverventions with customized supplements and enzymes to aid digestion for food intolerances; chelation of toxic metals; cranio-sacral therapy; music therapy; auditory therapies to address central auditory processing and sound sensitivity problems; hippotherapy; and sensory integration therapy to address low muscle tone and disordered sensory processing. The organizations listed below cover general integrative medical professionals and additional therapeutic modalities not covered in any of the other currently available guides. This organization includes allopathic and osteopathic physicians who practice medicine that acknowledges the interrelationship of body, mind, and spirit. AHMA provides listings of physicians who practice integrative medicine. For practitioners: findMT@musictherapy.org or contact per details above. Professionals trained in neurofeedback and biofeedback, more often applied to AD(H)D but of interest to some for ASD. A specialty society within the American Association of Naturopathic Physicians (above). IHA is an educational and charitable organization focusing on the needs of the hyperbaric community. Click on 'HBOT Clinics' from homepage menu to find member clinics. Find therapeutic horse riding centers at this web site. A few major organizations that deal primarily with conventional medical research and therapies are included due to their importance in funding and promoting cutting-edge research. Explores advanced and alternative treatments for autism, ADHD, Tourettes Syndrome and tics, and learning disabilities. Offers e-newsletter and publishes Latitudes magazine. Devoted to helping parents understand, implement and maintain a gluten-and-casein-free diet for their autistic children. Many links to dietary intervention studies and other resources; published a quarterly newsletter, The ANDI News, through 2005. Back issues are still relevant and available to order at discounted prices. Contains extensive resources and an on-line support network for autism-spectrum disorders. Though sources are not generally indicated, commentary/review of some treatments is included at http://www.autism-pdd.net/autism-treatments.html. A non-profit devoted to conducting research and disseminating results of research on the causes, prevention, diagnosis and treatment of ASD. Supports CAM/non-drug biomedical treatments, convenes the Defeat Autism Now! Conferences. Publishes the Autism Research Review International newsletter, summarizing articles from the world medical/scientific literature. Visitors may join an email-news list and order information packets and books, including the DAN! Clinical Manual from an extensive list on the site. Provides information, referral, advocacy, and fundraising for the autism community, with local chapters nation-wide. Info available on biomedical, dietary, and complementary treatments. Publishes quarterly newsletter, The Advocate, and free e-newsletter, ASA-Net. The ASA Foundation serves as the research-sponsoring arm of the organization. Founded in 2005, Autism Speaks merged with the National Alliance for Autism Research (NAAR) in 2006 and with Cure Autism Now Foundation (CAN) in 2007. The site has two main divisions: advocacy and information. Viewers can access a NAAR news archive. Founded in the mid-1990's, CAN has now combined forces with Autism Speaks (listed above). Disseminates information about causes and whole-child interventions for developmental delays, through the quarterly newsletter New Developments, workshops, conferences, library and website, as well as selling books and tapes. Electronically cross-referenced resources pertaining to autism and related conditions, including multi-media information. Find pages on some alternative treatments for autism at http://www.healthline.com/channel/autism_alternativetherapies. For further information see entry under Professional Organizations, above. NAAR has merged with Autism Speaks (above). You will be automatically redirected to the site from this url. Funds applied research on ASDs and offers a Parents' Guide to Research via the web site. Nonprofit, community-based organization sets forth, promotes and facilitates best practices for early intervention and the long-term care of individuals with ASDs through integrative research, educational outreach, model programs and collaborative initiatives. The primary function of USAAA is to conduct an annual conference where parents and caregivers of children with autism spectrum disorders can learn about effective interventions  both biomedical and educational. Offers a weekly e-newsletter often featuring highlighted research and speakers/experts from the conferences. Has been conducting studies in autism since 1982. Created an autism research database which is now housed in the London headquarters of the National Autistic Society. Current research still running includes studies of gluten-free diet for autism and urinary profiles from people with autism to uncover a possible metabolic disorder. Operates a clinic using an integrated, comprehensive approach in treating and finding cures for neuro-developmental disorders. Conducts conventional and CAM effectiveness studies (currently studies on Tomatis auditory integration therapy and gluten-free diet.) Partners with the NIH in funding and conducting some of the STAART and CPEA studies in autism (below). A single source of information about the NIH's CPEA (Collaborative Programs for Excellence in Autism) and STAART (Studies to Advance Autism Research & Treatment) networks and the research they conduct. Ten research programs started in 1997 by the National Institute of Child Health & Human Development (NICHD) and National Institute on Deafness & Other Communication Disorders (NIDCD), called The Collaborative Programs of Excellence in Autism (CPEAs), are now reorganized under the CDBPM. Research focused on environmental factors that may be related to autism, impact of exposure to mercury, and impact of reducing pollutants in the home and neighborhood is underway: the University of California at Davis, University of Illinois at Champaign/Urbana, and Children's Hospital of Cincinnati. This list focuses on clinics and centers that use non-standard tests and treatment protocols. Offers "Innovative laboratory testing and services for integrative medicine". Lists assessments for autism and other conditions. Directed by Dr. William Shaw, offers organic acid testing and evaluating abnormal levels of yeast and other components associated with symptoms of autism and many other diseases, and other varieties of metabolic tests. Site contains information pages on ASD/PDD and other disorders. Offers non-drug alternative for diagnosing and treating most neuro-developmental disorders; clinical services, community information, and professional training programs. Evaluates and treats children with developmental disorders through the integration of traditional science and medicine with recently developed and recognized therapies. Available lab tests include those for gluten sensitivity, food allergies, and hair mineral analyses (lead, mercury, etc.) and candida (yeast). Available tests include organic acids, membrane fatty acids, food allergies, and hair mineral analysis. Author and researcher Dr. Mary Megson's pediatric practice specializes in treating children and teens with ASDs. Focuses on research, education, and nutritional treatment of biochemical imbalances. The Health Research Institute is a non-profit and has a compounding pharmacy. Founded by British researcher Dr. Andrew Wakefield and autism-specialist colleagues, the center's mission is to fight "for the recovery of children with developmental disorders through the unique combination of medical care, education, and research." Conducts clinical trials and includes an equestrian center for therapeutic riding. "Learn the Signs. Act Early"
Free public access to the National Library of Medicine MEDLINE database of clinical research is available through PubMed and the Related Articles feature. NOTE: Promotional and commercial sites are not included in this listing unless they provide significant impartial information resources. Contains an Introduction to Possible Biomedical Causes and Treatments for Autism Spectrum Disorders. On-line resources and events in Canada , links to events such as DAN! Conference notes and audio files of vaccine hearings in the U.S.
Portal to a dozen member organisations related to autism. Has a searchable links library of studies on autism and dietary intervention, plus on-line information in ten different languages. What began as a worldwide, web-based radio station with a full schedule of regular specialist-hosted shows on everything pertaining to ASD, has grown to include blogs, videos, and many other features. Blog under the auspices of the Indiana Resource Center for Autism (see IRCA below). Sign up for free member registration to receive bi-monthly newsletter and access extensive information resources. On-line courses also available. Inform ation on training method devised by otolaryngologist, Dr. Guy Bérard, to enhance auditory processing, learning, and behavior. Separate pages on autism and Aspergers syndrome. Parents/grandparents of kids with autism/mercury poisoning following DAN chelation protocol with a physician. Article by Dr. Amy Holmes. This dietary/biochemical approach to treating ASD is a project of the Autism Research Institute. Explores the link between digestive enzymes, gut health, and neurology. Dietary intervention program for numerous disorders. Web site contains statistical information on prevalence and incidence rates dating back to 1993, nationally and state by state. Written and overseen by Lewis Mehl-Madrona, M.D., Ph.D., in affiliation with the University of Arizona College of Medicine's Program in Integrative Medicine. Affiliated with Indiana University's Institute on Disability and Community (IIDC), the IRCA site offers extensive online resources and access to the Autism Resources Blog (see above). A differing view from the NVIC (below), the IVS supports removal of thimerosol from vaccines, while asserting that it may play a part in early developmental delays in children, but not the more severe condition of autism. Offers training courses in developmental programs parents can implement with brain-injured children. Treatment developed primarily for AD(H)D, has been adapted by some therapists for persons with PDD. Online magazine, blog, e-newsletter and other resources exploring advanced and alternative treatments for autism, ADHD, Tourette's Syndrome, tics, and learning disabilities; from the Association for Comprehensive Neurotherapy. A practitioner's commercial site devoted to a drug-free treatment she devised that has been applied to autism. Site includes some treatment results data from 10 years of practice and a link to a list of practitioners trained in the technique. NARF coordinates double blind clinical trials on efficacy of NAET® treatments following the NIH research protocol. Not affiliated with federal government agencies, the NVIC provides information for "informed consent" of inoculations, with special sections on the site for autism-related issues. A categorized web directory of resources for autism spectrum disorders, covers many CAM treatments and includes link from homepage to the Neurodiversity Weblog. One of the most comprehensive sites for AS, though few CAM references. Includes links to international Asperger sites in many languages. Founded to investigate and raise awareness of the risks to infants and children of exposure to mercury from medical products. Supports research on the potential harmful effects of mercury and thimerosal. Site contains an archive of SAIT's "The Sound Connection" newsletter (1993-2003). The non-profit distributes information on auditory integration training (AIT) and other auditory-based interventions. All-volunteer run organization offers free surf camp days at several beaches on the Pacific and Atlantic coasts for children with autism. A full 'sensory diet' of water, sand, and movement where kids ride the boards in tandem with skilled surfers. Information on research and the use of traditional Chinese medicine for autism, from the web site of the Pacific College of Oriental Medicine. Developed by French ear-nose-throat specialist Dr. Alfred Tomatis; site has information pages for each disorder this method treats, especially hypersensitivity to sound in ASD.